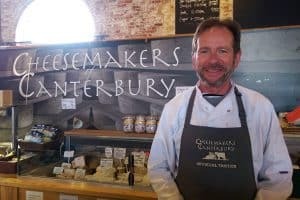 George Ward, manager of our retail outlet at The Goods Shed, Canterbury, tracks the ebb and flow of custom over a week. Weekends are our busiest time, which means come Monday, the only day we close, there’s a lot of re-ordering to do. We try to balance the need not to run out of any particular cheese against having so much it can hang around too long and lose its charm. So Monday’s ordering is all about filling in the holes on our shelves, and making a gamble on what kind of week we might be getting into. One quirk is an unconscious drift towards the orange cheeses, Cheshires, Gloucesters etc, when a leaden sky makes you feel like you’re living in a Tupperware box. Is it their rather sunny colours maybe? Good picnic weather will mean a bigger demand for soft cheeses. Softer cheeses ripen in the heat, whereas harder cheeses sweat rather unattractively. Crumbly goat’s cheeses for popping in salads will do well. Mid-week customers tend to be tourists or local pubs and restaurants. One new sub-set of customer is the visitor who has left their pet in care of a dog sitter. They, it seems, need not only to be paid, but thanked with a gift,and a choice of cheeses for Millie’s minder is a regular request. The fall in the value of Sterling has seen a strong return of Belgian, Dutch and even French tourists to Kent. The Belgians and Dutch go for the stronger hard and blue cheeses. The French are discovering real cheddars after having to make do with rectangular blocks of orange dairy product optimistically labeled Cheddar or, bafflingly, Chester. Relatively new on the scene are the Chinese. Don’t make the mistake of thinking that the entire, vast, collection of races inside China are all lactose intolerant. They are not. To feed their demand for dairy they now own almost half the dairy farms in New Zealand, the world’s biggest exporter of dairy. The chefs from the pubs and restaurants always bring feedback on the mood in the city. Are the crowds coming? Are they happy? Are they grumpy? Moods are catching, and grumpy people do not spend freely. It helps enormously that when chefs want to offer a totally Kentish cheeseboard we can offer them a range of hard, soft and blue, cow’s, goat’s and sheep’s cheeses all made within our borders. Ten years ago the possibility would never have crossed anyone’s mind. Thursday and Friday sees people shopping for the weekend. Few people eat cheese every day of the week, so we get many who want to make up a cheeseboard for one particular meal, and don’t want leftovers taking up room in their fridge afterwards. While some like to cast the net wide, rather like placing bets on every number on the roulette wheel, others limit the choice to four or five cheeses, and then buy large enough wedges that will provide enough for every guest should one prove particularly popular. 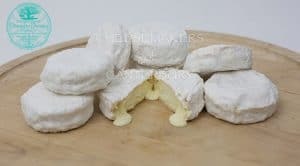 The softer cheeses are taking a large share of the cheeseboard, and goat’s and sheep’s cheese, especially the gentler flavoured ones, are increasingly being chosen for taste rather that dietary reasons. We have a very good Master of Wine at the Goods Shed who will send up customers wanting a cheese to go with a bottle of something special. While the port drinkers still go for the stronger cheeses like Ancient Ashmore, or a punchy blue, the fans of English whites are pairing them with runny-ripe Bowyer’s Brie or Winnie’s Wheel. If possible I like to walk down Canterbury’s main streets before work on a Saturday. The entire purpose of a city is to be a place to trade. Towns are where we go to shop in person. Early Saturday the pedestrianised roads are open to the trucks and vans supplying all the shops. If Friday has been good the energy levels at 7am Saturday are higher. There is a buzz, a bubbly certainty that this Saturday the customers will come and keep coming. Shelves are packed, re-supplies readied in backrooms, supplies of wrapping paper checked, and unless you are terminally stupid, bags of change for the tills are heaved down the road from the banks.